Before I really get stuck into the details of updating little bits and bobs my blog is in desperate need of - I thought I'd throw up a gluten free cake recipe (Procrastinating, me? Never). I personally find cake to be the holy grail of the gluten free dessert world. Not because I don't enjoy the odd meringue based recipe, flourless recipe or a gluten free fairy cake, but because cake, good cake - the kind that isn't too dry or has that 'false' moistness that some gluten free cake recipes can have or is made of polenta or has that uncomfortable grainy texture when eating - I can go on - is something that I have still yet to truly master. However, with this cake there is a little give. This is my version of a gluten free pineapple upside down cake. I love pineapple upside down cake. As gluten free cake can lend itself to being a little on the dry side of texture - the sugary, sweet, syrup of the upside down bit of this cake makes up for it. 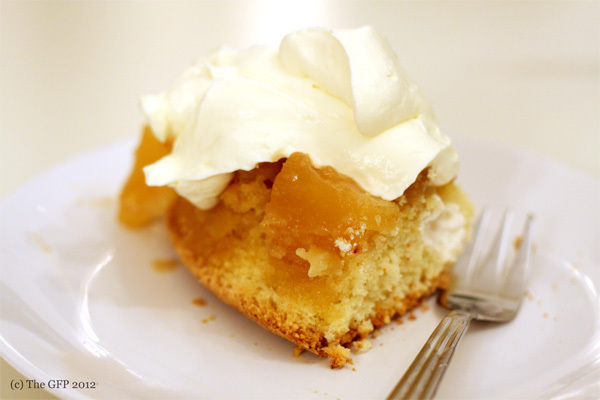 Plus, it tastes all the better for adding a good dollop of sweetened whipped cream when serving! Please see my 'Cups For Cooking' page for conversion measurements. -Preheat oven to 160 degrees C. My oven is a convection oven, not a fan oven, so you may have to drop your temperature to accomodate if baking using a fan oven. -Next, you'll need a 10 inch oven proof casserole dish. -To make the topping - place the casserole dish on the hob and melt the butter. Then add the soft brown sugar and a drop of milk. Bring the sugar mixture to a slow boil and stir until well dissolved. -Drain the pineapple (if using tinned) and add to the brown sugar mix, covering evenly. Make sure that the pineapple pieces do not overlap eachother. -To make the cake batter - sift together the flour and the baking powder and leave aside. -Separate the eggs into different bowls. Make sure to place the egg whites into a large bowl and the egg yolks into a smaller one. -Beat the egg yolks, vanilla extract and melted butter together. -Whip the egg whites until stiff. -Beat the caster sugar a little at a time into the egg whites - then add in the egg yolk mixture and blend - and finally beat in the sifted flour and baking powder a 1/4 cup at a time (I use a kitchenaid and keep it going at a medium speed and slowly add the ingredients - a hand held electric mixer is just as effective for this step). -Pour the cake batter on top of the brown sugar and pineapple mix in the casserole dish and place on the middle rack in the oven. -Bake in the oven for at least 50 mins or until a cake tester will come out clean when put in half way (so as not to reach the syrup at the bottom of the dish). 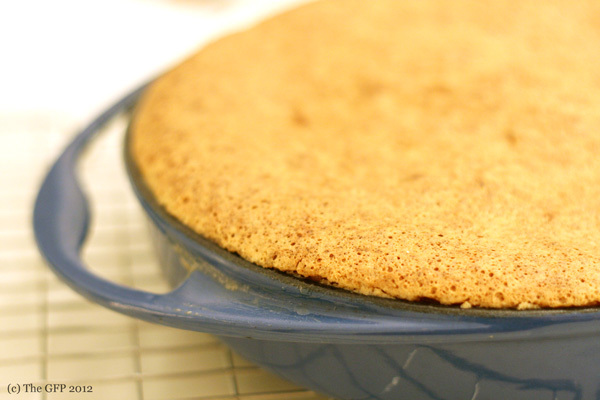 -Remove from the oven and leave the cake to cool a little in the dish, before serving. Do not turn the cake out of the casserole dish. Just slice a piece and place upside down when plating up. Serve with sweetened whipped cream and enjoy! To make the sweetened whipped cream - beat as much cream as you want, in a bowl. When it is forming soft peaks, add sifted icing sugar (to taste) and stir in until dissolved. Do not beat the cream too much or you'll end up with a buttery consistency rather than a lovely soft whipped cream. Yum! you make me want to go home! This cake reminds me of a GF & dairy free one my mom and sister invented together a couple years ago, although it is technically quite different but still - hello! I think this one could easily be substituted to being at least Dairy free - yum yum yum! I'm salivating ;) Thanks for sharing!